The sunbeam snake (Xenopeltis unicolor) is native to Indonesia and is often encountered in rice paddies. This species garners its common name from the incredible iridescence of its scales, a trait difficult to capture on film. The ground color of the snake's dorsal side is a dark brown, almost black, with the ventral side being a white or cream color. In the sunlight, or under strong artificial light, the scales scatter the illumination like a prism, showcasing a breathtaking display of rainbow coloration. There is no snake in the world that can rival the iridescent of the sunbeam snake, this species most enchanting feature. In the wild these snakes are totally fossorial (burrowing) and spend most of their time underground. Their morphology strongly reflects this lifestyle, as their heads are sharply pointed with little neck delineation, enabling them to move underground with ease. In the wild, sunbeam snakes eat a variety of prey including amphibians, lizards, small mammals, and other snakes. Young sunbeam snakes look very similar to the adults, except that they have a strong white "collar" of white scales evident just below the head. This coloration fades within the first year. Sunbeam snakes are not often captive bred, so they are heavily imported. This is rather unfortunate as most imported animals die within the first six months of capture. Wild-caught sunbeam snakes stress very easily, this combined with improper environmental conditions encountered during transport and holding at wholesale facilities, is just too much for many of these snakes. 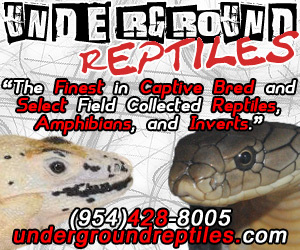 However, animals that survive importation can acclimate well if properly housed and attended to by a good reptile vet. There are really only four things required to keep sunbeams snakes successfully, humidity, a burrowing medium, proper temperatures, and solitude. Sunbeam snakes hail from an extremely humid habitat (ever seen a rice paddy?-rice grows in wetland conditions), as such, they require very high humidity in captivity in order to do well. I keep my sunbeams at about 80-100% humidity all of the time. Many sunbeams snakes develop a condition that looks like blistering on their scales, this looks similar to a disease caused by excessive humidity-it is not. I am sure that many people, upon seeing this condition in sunbeams have thought that drying the snakes out would cure this problem, drying sunbeam snakes out kills them quickly. This is a bacterial infection exacerbated by stress and will disappear with correct antibiotic treatment and a humid environment. Secondly, as sunbeams have evolved to be fossorial animals, they need a substrate in the cage to burrow in. I use 6-8 inches of cypress mulch, but other substrates such as moss or small reptile bark would work just as well. I keep the cypress mulch very moist, but not wet. The hot end of the cage is 86-88 degrees F and the cool end is 75-80 degrees F. All of the sunbeams I have kept have readily accepted stunned rodents from tongs. These snakes have an incredible feeding response so watch your fingers! Sunbeams snakes constrict their prey like other snakes, but I swear they are the fastest eaters I have ever seen, no other species can even compare to the speed at which sunbeams subdue and swallow prey. This may be because they are vulnerable when they are above-ground (where they must be to find prey and eat) so the faster eating snakes were exposed to less predation and passed on their genes to future generations (bear with me, I am a graduate student in ecology-I can't help it). One thing that new owners should be warned about-these snakes have a NASTY musk, and I mean nasty. If you get musked by an irate sunbeam, plan on taking a shower and washing the clothes you were wearing about five times. As sunbeams stress easily, do not handle them unless it is absolutely necessary. So success with sunbeams amounts to four things; keep them humid, buried, warm, and leave them alone. I have kept a colony of 15 sunbeam snakes successfully with no losses in this manner for 4 years. However, even under ideal conditions, sunbeam snakes (especially recent purchases) may still die. I keep these snakes in an effort to develop a successful captive breeding program, which will hopefully reduce the amount of animals taken from the wild. We did produce sunbeams in 1997, but have had no luck since.